We’ve looked at ladies fashion from Penney’s in 1968 — here are the men. Can you say “Groovy, Baby”? 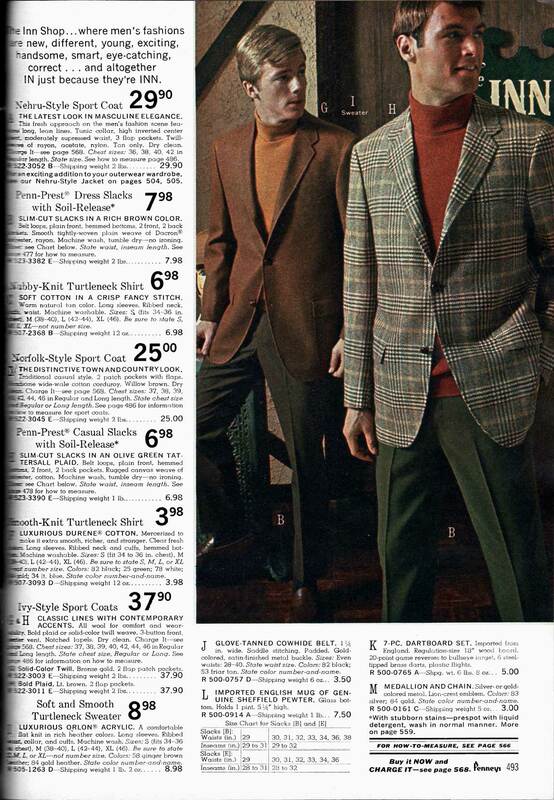 In the 1960s, men (young ones, anyway) were starting to break free of the grey flannel suits which had been the inevitable male uniform for at least 5 decades. 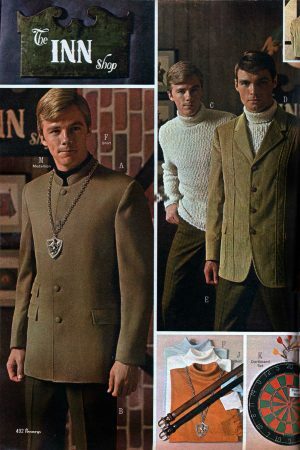 Was anything groovier than the Nehru jacket? Jawaharlal Nehru, the Prime Minister of India from 1947 to 1964 wore jackets that inspired the ’60 Nehru jacket style – although he never wore anything quite like this. Not only has this been tricked out with a medallion (I never met anyone who actually wore one) but also a black turtleneck. 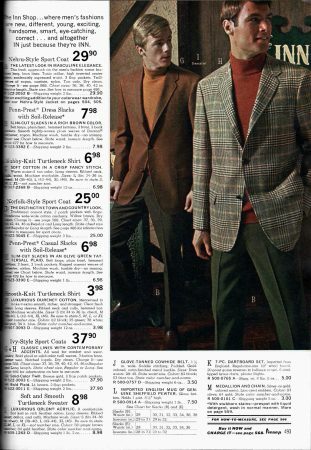 In fact, turtlenecks are clearly another groovy trend: turtleneck sweaters worn with corduroy jackets; turtlenecks worn under sport coats; turtlenecks in harvest gold with plaid jackets and polyester pants. These young fellows are part of the “In” crowd for sure – they look like members of a hip folk-rock music combo… but watch out, the seeds of ’70s disco fashion are being sown here. Or sewn, if you’ll pardon the pun. Previous Previous post: Hat, wig, or go natural?